A mother who was forced to stand while breastfeeding on a crowded train, has urged people to show "common courtesy". But often it's not selfishness that stops us from making a kind gesture, it's a fear of the consequences. We've all been on a crowded bus, a rush-hour train or Tube carriage with people packed like sardines - when someone gets on and looks around for a seat. Maybe you haven't noticed them - headphones clamped to your ears, attention gripped by a podcast. Or perhaps your eyes are fixed to your phone, your head absorbed in a mind-numbing game. Maybe you haven't noticed. Or just maybe, you've pretended not to notice. That, says mother Kate Hitchens, was the reason she was forced to stand on a busy train while breastfeeding her baby. There are plenty of other examples of people needing seats and passengers refusing to move. Selfishness and inattention play a part, says Dr Oliver Scott Curry, an expert in human behaviour, based at the University of Oxford. But, in some cases so does buck-passing. "Everyone can be waiting for someone else to do it, thinking 'why should it be me? I'm exhausted'. "They're just passing the buck." Almost everyone has heard of someone graciously offering a seat to a "pregnant" woman, only to be rebuked for their insensitivity. The woman in question had actually just enjoyed a big lunch and would be perfectly fine standing, thanks very much. "There's a fear of getting it wrong, of seeming patronising or thinking someone is a charity case. It doesn't hurt for the person needing help to ask for it." And yet, just when it seems like humanity is doomed by self-interest, Dr Curry has observed a encouraging flipside - "competitive helping". This, he says, is where passengers almost fall over themselves to give up their seat to prove they're the most chivalrous. Image caption Mary Killen says society is "increasingly selfish"
Gogglebox star and social etiquette expert Mary Killen can remember a time when it was "the custom that men always made their seat available to women and older people". "But now I think they've been frightened by feminists biting their heads off." Ms Killen, who writes an advice column for The Spectator magazine, says denial among seated passengers is not a reasonable excuse. "It's usually clear when someone needs a seat as they are either looking for [one] or trying to make eye contact. People should offer." Are badges for hidden conditions working? What about the risk of social stigma at offering your hard-earned pew to someone who isn't in need. "It's worth getting your head snapped off, because these little acts of recognition of other humans are of such value." Of Kate Hitchens' experience, Ms Killen says simply that "someone should have given this lady a seat. It's extraordinary no one did, unless they were all zombified by their mobiles". "I also think we're becoming increasingly selfish as a society." Rebecca Willcox, who has secondary breast cancer, has written about her experience of interacting with strangers who cannot see she's unwell. "From your perspective, riding a few stops without a seat isn't a great inconvenience, but for me it can mean a period of constant bangs and painful jolts to my back," she wrote in an article for Breast Cancer Care. Speaking to BBC News, Mrs Willcox says she always asks for a seat as she doesn't expect people to look around and notice her badge announcing she needs to sit down. "Only once has someone leapt up without me asking." But when she has asked, "every single time, someone has offered me a seat" although she has detected "grumbles." Mrs Willcox says one woman didn't think there was anything wrong with her while a man seated on a busy platform gawped at her stomach, to see if she was pregnant, before giving up his privileged place. "I've also had an entire carriage stand up, and it's almost embarrassing to have to choose who to turf out. "Another time, someone at the opposite end stood up - other people had clearly looked at me and thought 'no'. I then had the awkward situation of having to shuffle past them. "Looking at me, you wouldn't know there was anything wrong. But I'm on aggressive chemotherapy and need to sit down as I'm nauseous most of the time. "It makes me a bit sad that people have looked at me and decided for themselves I don't need a seat. I almost want to tell them: 'You have no idea how difficult it is, living with cancer and chemotherapy side effects'." Adam Partridge from etiquette experts Debrett's offers the following advice: "If you see someone that looks as if they are uncomfortable and would appreciate a seat, then it is good manners to offer yours." It is better to ask and be rejected than not ask at all, he advises, and that "there's a responsibility on both sides to refrain from taking offence". So what can transport companies do? Dr Curry says he wants others to follow the example of Transport for London, which initiated the "baby on board" badge scheme. It's also now launched a badge for those with other, less obvious, reasons they need to take the weight off their feet. The "Please offer me a seat" badge has been issued 81,000 times, with the scheme adopted by Greater Anglia Trains and the New York Transit Authority. 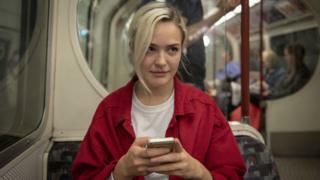 And over the summer it also backed the Look Up campaign started by Corry Shaw, who uses the Please Offer Me a Seat badge, but found often people just avoided eye contact, or didn't notice her at all. Ms Shaw, who has a spine disorder, said it "makes her sad" that some people are embarrassed or scared of causing offence. "If you are unsure about offering in case you cause offence you don't need to verbally offer," she wrote, "just stand and if the person needs the seat believe me they will jump right in it (or sort of wobble into it if it's me)."